Last week, Defenders of Wildlife and Washington Environmental Council visited Sherman Elementary School in Tacoma, WA to talk about Southern Resident orcas and why they love raingardens. Southern Resident orcas are a unique group of orcas that spend over half the year in the Salish Sea, which includes Puget Sound, the Strait of Juan de Fuca and the Strait of Georgia. These orcas are one of the most endangered marine mammal populations in the world, primarily because their main prey, Chinook salmon, is also threatened and declining. To make matters worse, these whales are also the most polluted marine mammals in the world. Various toxics have been found in these whales at dangerously high levels. This pollution causes a host of health problems and has severely impacted the population’s ability to grow. In the Salish Sea, the biggest source of pollution is stormwater runoff – the rainfall that gathers all the pollution on our roofs, streets, lawns and parking lots. This toxic cocktail often flows directly into Sea, untreated. These toxics end up in the food chain and accumulate in predators as they eat contaminated prey. As orcas consume more and more contaminated salmon, they also consume the toxics in the fish. Stormwater runoff has also been shown to kill and harm salmon and their habitat. By reducing stormwater runoff entering the Salish Sea, we can both keep pollution out of orcas and improve the habitat for the Chinook salmon these whales rely on. Raingardens are a great way to keep pollution out of the Salish Sea. These are bowl-shaped gardens that collect, absorb and naturally filter stormwater runoff. 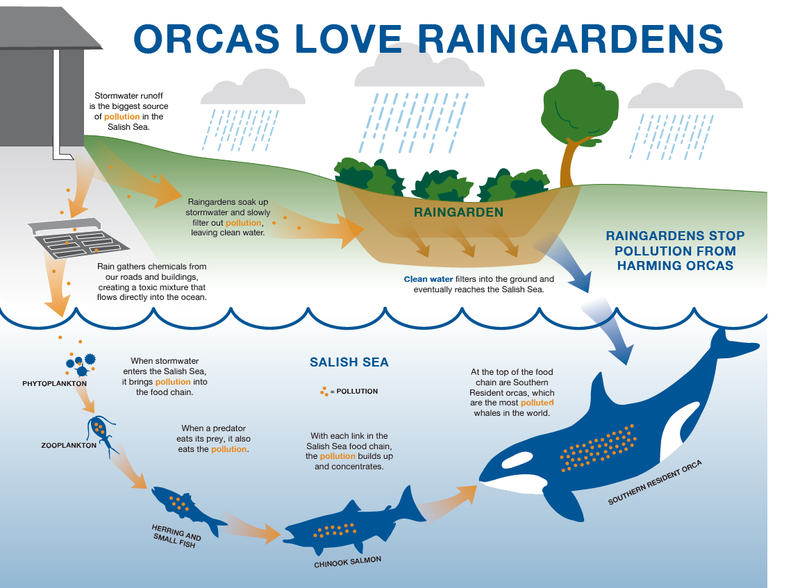 By relying on nature, we can clean stormwater and protect orcas by installing raingardens. That’s why we’ve launched Orcas Love Raingardens. The goal of this program is to promote raingardens at public schools and parks. Public raingardens can often be larger than raingardens at individual homes, which means they can collect and treat more stormwater. Public raingardens offer an excellent opportunity to educate the public and students about orcas and ways they can help keep stormwater out of the Salish Sea. OLR launched in Tacoma, which currently has the world’s largest stormwater biofiltration facility (a technical way to say “big raingarden”). The city has been a pioneer on mitigating stormwater runoff, and several school and parks already had raingardens on property. Orcas Love Raingardens is a collaborative, local effort, and we have been fortunate to work with the city, Tacoma Public Schools, Metro Parks Tacoma and Pierce Conservation District to develop and build this program. Raingardens are a high priority in Tacoma. Last week, Defenders and Washington Environmental Council engaged some of our most enthusiastic partners: first graders. Our first-grade audience has been doing research on the raingarden at their school. Sadly, this raingarden needs to be replanted and cleaned up. These students are researching the plants they want to use, features to include and how to maintain the raingarden. Their raingarden is also one of the first in our Orcas Love Raingardens program. The students were extremely passionate about the raingarden, and they were deeply concerned about the plight of the Southern Resident orcas. When we asked them questions about their raingarden and what they need, the students told us about the different plants and needs of each section of the raingarden. They also told me how the sections vary based on how much water accumulates there. The students emphasized the importance of not compacting soil in the raingarden or clogging input pipes with litter. 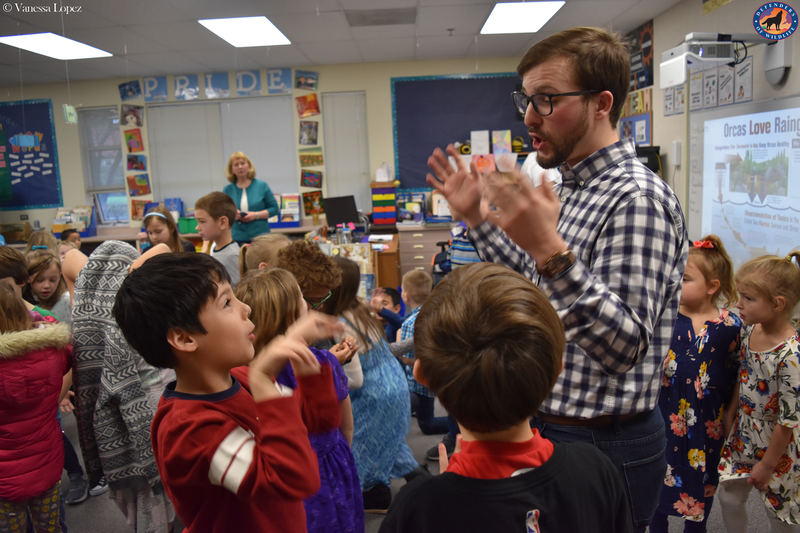 Needless to say, this level of expertise from a group of first-graders is impressive! After discussing some of their ideas and learning more about their raingarden, we announced to them that the Orcas Love Raingardens program would buy them the plants and materials they need for their raingardens (and faces lit up!). These students will be such great partners to work with, and meeting with them reminded me of the importance of inspiring and engaging the next generation of wildlife advocates!